I've been too busy with clients and family trips to post much, but I thought this subject deserved mention. This is a terrific scholarship, named after a man who had a big effect on the work of many cartoonists. 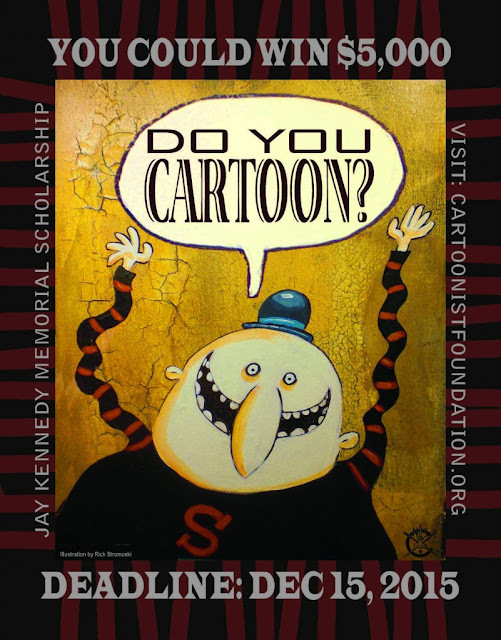 Every year the National Cartoonists Society bestows the Jay Kennedy Memorial Scholarship to one talented college student pursuing a career in cartooning. This includes comic strips, political cartoons, comic books, animation, graphic novels, editorial illustration… any cartooning discipline. The scholarship award is $5,000 and a free trip to the NCS Reuben Awards. Well, if you want to win the scholarship,you need to submit your work, and the deadline is December 15th!!! Gather up your best and send it in. I had the pleasure of working with Jay Kennedy for three years. He offered me my first syndication contract, and after that, worked with me in developing two comic strips for King Features Syndicate. I can say without a doubt that he helped to establish my career as a cartoonist, giving me training that was unavailable in any books or schools. The annual Jay Kennedy Scholarship, in memory of the late King Features editor, was funded by an initial $100,000 grant from the Hearst Foundation/King Features Syndicate and additional generous donations from prominent cartoonists. Submissions are adjudicated by a panel of top cartoonists and an award is given to the best college cartoonist. 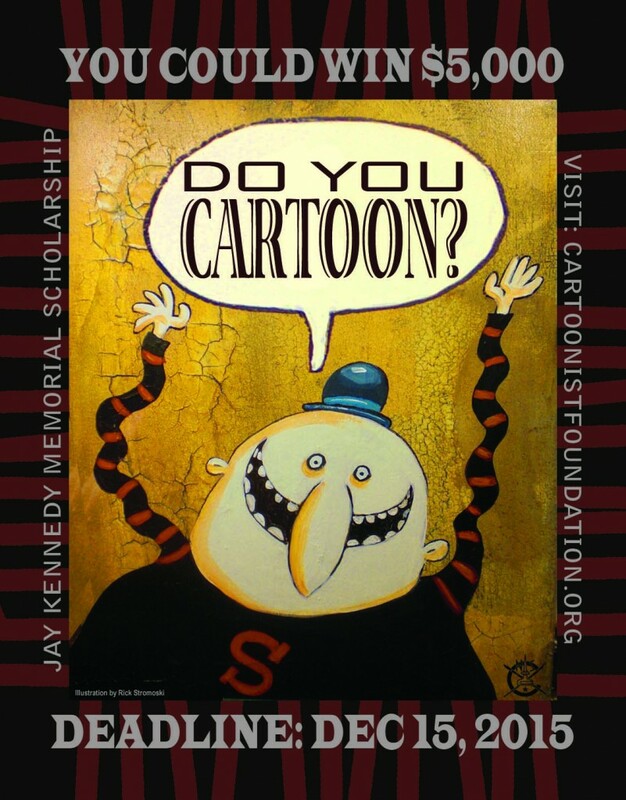 This memorial scholarship is the sort of thing that can launch a young cartoonist's career. If you think that might be you, enter now! Copied below is the official press release, and a link to get the info on submitting. Do you need $5000 for college? Are you a college student doing cartooning? Then you could apply for the Jay Kennedy Scholarship. But hurry the deadline is December 15, 2015. The annual Jay Kennedy Scholarship, in memory of the late King Features editor, was funded by an initial $100,000 grant from the Hearst Foundation/King Features Syndicate and additional generous donations from Jerry Scott, Jim Borgman, Patrick McDonnell and many other prominent cartoonists. A panel of top cartoonists adjudicates submissions and an award is given to the best college cartoonist. The recipient is feted at the annual NCS Reuben Awards Convention attended by many of the world’s leading cartoonists.